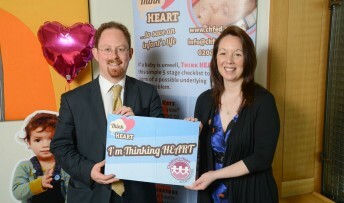 MP Julian Huppert has backed a campaign to increase early diagnosis of children’s heart conditions and has urged parents across Cambridge to watch for warning signs. Julian is supporting Think HEART run by the Children’s Heart Federation which provides five easy signs to help detect a heart problem. H – Heart rate – is the heart rate too fast or too slow. Normal rate is between 100 and 160 beats a minute. E – Energy – is the child sleepy, quiet and too tired to feed? A – Appearance – is the baby’s colour pale, waxy, dusky, blue or grey? R – Respiration – is the child breathing too fast or too slow? Normal rate is between 40 to 60 breaths a minute. T – Temperature – is the child cold to touch, particularly hands and feet. Anne Keatley-Clarke, Chief Executive of CHF says: “We are grateful for Julian’s support for our campaign. Julian is pictured with CHF parent volunteer, Alex Smith who has a daughter with a congenital heart condition.